Our 2004 Dodge Ram 2500 Crew Cab 4X2 boasts the upscale SLT trim package. This extraordinary truck will tear up the road with it's 5.7 Liter V8 HEMI that's connected to a durable Automatic transmission. When it comes to towing and hauling, nothing can take on more work than this full-size, Rear Wheel Drive heavy duty Ram. While this bad boy was built to take on the most demanding tasks, this 2004 Dodge Ram 2500 is still a surprisingly comfortable truck for daily use. This Crew Cab has ample seating for you and all of your family, friends, pets, and gear. Plus, four doors are ideal for easy loading and unloading the cabin! So load this one up and hit the road! 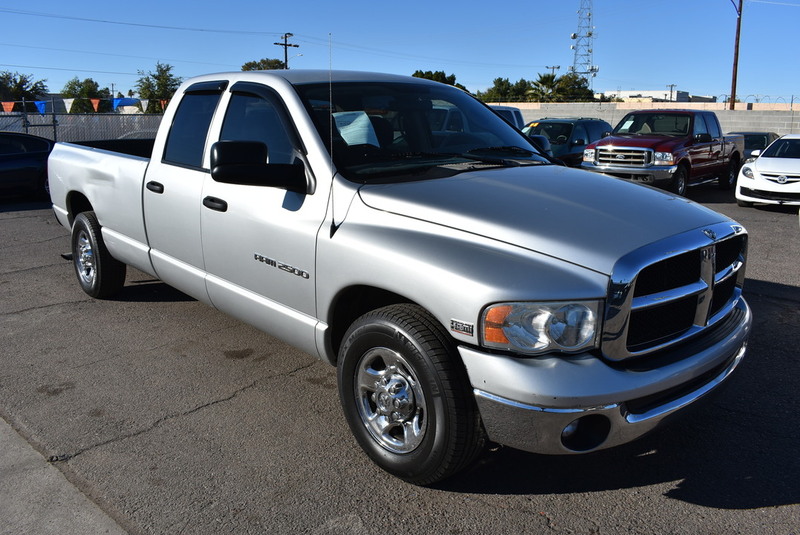 Our 2004 Dodge Ram 2500 has your safety in mind with Anti-lock brakes, and Next Generation airbags is a power house just waiting for a new home! Print this page and call us Now... We Know You Will Enjoy Your Test Drive Towards Ownership! This one checks all the box's! Arizona truck with no accidents per CARFAX!! 17 service records per CARFAX!